Leflunomide, flutamide, nimodipine, mexiletine, sulindac, tranilast, 4-hydroxytamoxifen, and omeprazole are pharmaceuticals previously characterized as aryl hydrocarbon receptor (AHR) agonists in various cell lines and animal models. In this study, the eight AHR-active pharmaceuticals were investigated in highly aggressive aryl hydrocarbon (Ah)-responsive BT474 and MDA-MB-468 breast cancer cell lines, and their effects on AHR protein, CYP1A1 (protein and mRNA), CYP1B1 (mRNA), and cell migration were determined. 2,3,7,8-Tetrachlorodibenzo-p-dioxin (TCDD) was used as a positive control. The AHR agonist activities of the pharmaceuticals depended on structure, response, and cell context. Most compounds induced one or more AHR-mediated responses in BT474 cells, whereas in Ah-responsive MDA-MB-468 cells effects of the AHR-active pharmaceuticals were highly variable. 4-Hydroxytamoxifen, mexiletine, and tranilast did not induce CYP1A1 in MDA-MB-468 cells; moreover, in combination with TCDD, mexiletine was a potent AHR antagonist, tranilast was a partial antagonist, and 4-hydroxytamoxifen also exhibited some AHR antagonist activity. Omeprazole and, to a lesser extent, sulindac and leflunomide were full and partial AHR agonists, respectively, in both breast cancer cell lines. These data indicate that the AHR-active pharmaceuticals are selective AHR modulators, and applications of these drugs for targeting the AHR must be confirmed by studies using the most relevant cell context. The aryl hydrocarbon receptor (AHR) binds with high affinity to the environmental toxicant 2,3,7,8-tetrachlorodibenzo-p-dioxin (TCDD) and with moderate to low affinity to structurally diverse health-promoting phytochemicals, endogenous biochemicals, and several pharmaceuticals that are clinically used for treating multiple disorders (Poland et al., 1976; Safe, 1986; Denison et al., 2011; Safe et al., 2012). The molecular mechanism of action of AHR ligands has been extensively investigated, and ligand-dependent activation of the AHR generally results in formation of a nuclear AHR-AHR nuclear translocator heterodimer, which binds dioxin responsive elements (DREs) in target gene promoters to activate transcription (Denison et al., 2011). Our studies initially focused on the development of AHR antagonists that inhibited TCDD-induced toxicity, and we identified 6-methyl-1,3,8-trichlorodibenzofuran (MCDF) as an inhibitor of TCDD-induced CYP1A1, porphyria, immunotoxicity, and teratogenicity in rodent models (Astroff et al., 1988; Bannister et al., 1989; Harris et al., 1989; Yao and Safe, 1989). However, MCDF did not inhibit TCDD-induced antiestrogenic effects in the rodent uterus or human breast cancer cells but acted as an AHR agonist (Astroff and Safe, 1991; Zacharewski et al., 1992), and subsequent studies showed that MCDF also inhibited ER-positive and ER-negative breast cancer cell and tumor growth (McDougal et al., 2001; Zhang et al., 2009, 2012). Thus, MCDF was one of the first compounds characterized as a selective AHR modulator (SAhRM) that exhibits tissue-selective AHR agonist or antagonist activities (Astroff and Safe, 1991; Zacharewski et al., 1992; McDougal et al., 2001; Zhang et al., 2009, 2012), and several other AHR antagonists and SAhRMs have been identified (Boitano et al., 2010; Murray et al., 2010, 2011; Zhao et al., 2010; Smith et al., 2011). In this study, we investigated the activity of eight AHR-active pharmaceutical agents as SAhRMs in two different Ah-responsive breast cancer cell lines: ER-negative MDA-MB-468 cells and epidermal growth factor receptor 2 (ErbB2)-overexpressing BT474 cells (Zhang et al., 2009). Both cell lines are aggressive and represent subclasses of breast cancer that do not respond well to endocrine therapy but are growth-inhibited by TCDD and MCDF (Zhang et al., 2009). The pharmaceuticals (and their applications) include leflunomide (anti-inflammatory), flutamide (antiandrogen), nimodipine (calcium channel blocker), mexiletine (antiarrhythmic), and sulindac (anti-inflammatory), which induce CYP1A1 rodent systems (in vivo and in vitro) (Ciolino et al., 2006; Hu et al., 2007; O'Donnell et al., 2010); tranilast (antiallergic drug), which exhibits AHR agonist activity and inhibits breast cancer cell and stem cell growth (Prud'homme et al., 2010); 4-hydroxytamoxifen, which induces CYP1A1/1B1 in breast cancer cells and suppresses osteoclast differentiation (DuSell et al., 2010); and omeprazole (Quattrochi and Tukey, 1993; Dzeletovic et al., 1997; Hu et al., 2007), which also induces CYP1A1 and exhibits other AHR agonist activities. We investigated the effects of these pharmaceuticals on AHR expression, CYP1A1 (protein and mRNA), CYP1B1 mRNA and protein, and functional responses in MDA-MB-468 and BT474 cells and compared these effects with results for TCDD. The Ah responsiveness of these agents was highly variable and depended on the response and cell context. The results indicate that the AHR-active pharmaceuticals are SAhRMs, and future clinical applications of drugs targeting the AHR must be confirmed by studies using the most relevant cell context. Cell Lines, Antibodies, and Reagents. MDA-MB-468 human breast cancer cell lines were obtained from the American Type Culture Collection (Manassas, VA). MDA-MB-468 cells were maintained in Dulbecco's modified Eagle's medium (DMEM) nutrient mixture supplemented with 0.22% sodium bicarbonate, 0.011% sodium pyruvate, 10% fetal bovine serum (FBS), and 10 ml/liter 100× antibiotic/antimycotic solution (Sigma-Aldrich, St. Louis, MO). Cells were maintained at 37°C in the presence of 5% CO2, and the solvent (DMSO) used in the experiments was ≤0.2%. CYP1A1, CYP1B1, AHR, and β-actin antibodies were purchased from Santa Cruz Biotechnology, Inc. (Santa Cruz, CA). All compounds used in this study were purchased from Sigma-Aldrich. The reagents for 3-[4,5-dimethylthiazol-2-yl]-2,5-diphenyltetrazolium bromide (MTT) assay and cell staining were supplied by Sigma-Aldrich. Cell Proliferation (MTT) and Ethoxyresorufin-O-Deethylase Assays. Cells (5 × 103 per well) were plated in 96-well plates and allowed to attach for 16 h. The medium was then changed to DMEM containing 2.5% FBS, and either vehicle (DMSO) or different concentrations of the compounds were added. After 24 h, treatment medium was replaced with fresh medium containing 0.05 mg of MTT per 100 μl and incubated for 4 h. Medium was then removed, and 100 μl of dimethyl sulfoxide was added to wells. The optical density of each sample was read on a microplate reader (FLUOstar OPTIMA; BMG Labtech, Durham, NC) at 570 nm against a blank prepared from cell-free wells. Cell proliferation was expressed as a percentage of relative absorbance of untreated controls. Ethoxyresorufin-O-deethylase assays were determined as described previously (Zhang, 2009). The ChIP assay was performed by using the ChiP-IT Express Magnetic Chromatin Immunoprecipitation kit (Active Motif, Inc., Carlsbad, CA) according to the manufacturer's protocol. MDA-MB-468 cells (5 × 106 cells) were treated with DMSO, TCDD, or compounds for 1 h. Cells were then fixed with 1% formaldehyde, and the cross-linking reaction was stopped by the addition of 0.125 M glycine. After washing twice with phosphate-buffered saline, cells were scraped and pelleted. Collected cells were hypotonically lysed, and nuclei were collected. Nuclei were then sonicated to the desired chromatin length (∼200–1500 base pairs). The sonicated chromatin was immunoprecipitated with IgG or AHR antibodies and protein A-conjugated magnetic beads at 4°C overnight. After the magnetic beads were extensively washed, protein-DNA cross-links were reversed and eluted. DNA was prepared by proteinase K digestion followed by PCR amplification. The CYP1A1 primers were 5′-TCA GGG CTG GGG TCG CAG CGC TTC T-3′ (sense), and 5′-GCT ACA GCC TAC CAG GAC TCG GCA G-3′ (antisense), and then a 122-base pair region of human Cyp1A1 promoter that contained the AHR binding sequences was amplified. PCR products were resolved on a 2% agarose gel in the presence of ethidium bromide and detected by real-time PCR using SYBR Green. cDNA was prepared from the total RNA of cells by using a reverse transcription system (Promega, Madison, WI). Each PCR was carried out in triplicate in a 20-μl volume by using SYBR Green Mastermix (Applied Biosystems, Foster City, CA) for 15 min at 95°C for initial denaturing, followed by 40 cycles of 95°C for 30 s and 60°C for 1 min in the Applied Biosystems 7900HT Fast Real-time PCR System. The ABI Dissociation Curves software (Applied Biosystems) was used after a brief thermal protocol (95°C for 15 s and 60°C for 15 s, followed by a slow ramp to 95°C) to control for multiple species in each PCR amplification. Values for each gene were normalized to expression levels of TATA-binding protein (TBP). The sequences of the primers used for real-time PCR were as follows: CYP1A1, sense 5′- GAC CAC AAC CAC CAA GAA C-3′, antisense 5′-AGC GAA GAA TAG GGA TGA AG-3′; CYP1B1, sense 5′- ACC TGA TCC AAT TCT GCC TG-3′, antisense 5′-TAT CAC TGA CAT CTT CGG CG-3′; and TBP, sense 5′-TGC ACA GGA GCC AAG AGT GAA-3′, antisense 5′-CAC ATC ACA GCT CCC CAC CA-3′. Primer sets were selected from the qPrimerDepot system (http://primerdepot.nci.nih.gov) and purchased from Integrated DNA Technologies Inc. (Coralville, IA). Cells (2 × 105) were plated in six-well plates in DMEM containing 2.5% charcoal-stripped FBS for 16 h and then treated with different concentrations of the compounds. Cellular lysates were prepared in a lysis buffer containing 50 mM Tris-HCl, pH 7.5, 2 mM EDTA, 150 mM NaCl, 0.5% deoxycholate, 0.1% SDS, 1 mM NaF, 1 mM Na3VO4, 1 mM phenylmethylsulfonyl fluoride, 5 μl/ml Protease inhibitor cocktail (Sigma-Aldrich), and 1% nonidet P-40. The cells were disrupted and extracted at 4°C for 30 min. After centrifugation, the supernatant was obtained as the cell lysate. Protein concentrations were measured by using the Bio-Rad protein assay (Bio-Rad Laboratories, Hercules, CA). Aliquots of cellular proteins were electrophoresed on 10% SDS-polyacrylamide gel electrophoresis and transferred to a polyvinylidene difluoride membrane (Bio-Rad Laboratories). The membrane was allowed to react with a specific antibody, and detection of specific proteins was carried out by enhanced chemiluminescence. Primary antibodies were incubated for 15 h at 5°C and secondary antibodies for 2 h at 4°C. Loading differences were normalized by using a polyclonal β-actin antibody. The migration of MDA-MB-468 cells was tested by using a modified Boyden chamber assay. In brief, the 24-transwell chambers (Corning Life Sciences, Lowell, MA) with 8-μm pore-size polycarbonate membrane were used. The medium in the lower chamber contained 10% FBS and conditioned culture medium of NIH 3T3, which acts as a chemoattractant. MDA-MB-468 cells (2.5 × 105 cells/insert) were plated into the upper chamber with or without various concentrations of compounds and incubated for 24 h at 37°C, 5% CO2. After incubation, the nonmigrated cells were removed from the upper surface of the membrane with a wet cotton swab. The migrated cells on the lower surface of the membrane were fixed with 10% formalin for 10 min and stained in hematoxylin for 30 min and eosin Y solution for 1 min. After washing and drying, the numbers of cells in five adjacent fields of view were counted under 100× magnification. AHR knockdown by RNA interference was determined as described previously (Zhang, 2009). All of the experiments were repeated a minimum of three times. The data are expressed as the means ± S.E. Statistical significance was analyzed by using either Student's t test (for data in Figs. 1⇓–3 and 6 and Supplemental Figures) or analysis of variance with Scheffe's test (Figs. 4 and 5). The results are expressed as means with error bars representing 95% confidence intervals for three experiments for each group unless otherwise indicated, and a p value of < 0.05 was considered statistically significant. The ligand-activated AHR induces multiple responses and genes in breast cancer cells, and this study investigated the effects of eight pharmaceutical agents that bind and activate the AHR in one or more cell lines (Dzeletovic et al., 1997; Ciolino et al., 2006; Hu et al., 2007; DuSell et al., 2010; O'Donnell et al., 2010; Prud'homme et al., 2010). Results in Supplemental Fig. 1 summarize the growth inhibitory effects of these drugs using the MTT assay at concentrations used in previous studies. All of these compounds inhibited cell growth by at least 18 to 20% in BT474 and MDA-MB-468 cells; there were some differences in potencies between the two cell lines, and the best example was sulindac where BT474 cells were more resistant than MDA-MB-468 cells (Supplemental Fig. 1D). The AHR protein is expressed in MDA-MB-468 and BT474 cells (Zhang et al., 2009); treatment with TCDD induced CYP1A1 and decreased AHR protein expression in both cell lines (Fig. 1A). The effects of most AHR-active pharmaceuticals on AHR protein levels were highly variable, and only omeprazole and sulindac consistently decreased AHR protein in both cell lines (Supplemental Fig. 2). There was considerable variability in the induction of CYP1A1 protein by the AHR-active pharmaceuticals (Fig. 1) caused, in part, by the loss of CYP1A1 inducibility at the higher concentrations of leflunomide, omeprazole, and sulindac (Fig. 1, C and D). At one or more concentrations, all three compounds and nimodipine induced CYP1A1 protein in both cell lines; 4-hydroxytamoxifen, mexiletine, and tranilast (Fig. 1, A, B, and D) slightly increased levels of CYP1A1 in BT474 cells but not MDA-MB-468 cells, whereas flutamide induced CYP1A1 protein in MDA-MB-468 but not BT474 cells (Fig. 1A). Induction of CYP1A1-dependent ethoxyresorufin-O-deethylase activity by TCDD was observed for both TCDD and the AHR-active pharmaceuticals in MDA-MB-468 and BT474 cells; however, only leflunomide induced responses ≥35% of that observed for TCDD (Supplemental Fig. 3). TCDD, leflunomide, nimodipine, mexiletine, omeprazole, and tranilast also induced CYP1B1 protein in MDA-MB-468 cells, whereas minimal to nondetectable levels were observed after treatment with 4-hydroxytamoxifen, sulindac, or flutamide (Supplemental Fig. 4). In contrast, only TCDD, leflunomide, and nimodipine induced CYP1B1 protein in BT474 cells. There was minimal correlation between the induction of CYP1A1 protein (Fig. 1) and CYP1A1 mRNA levels for most of the AHR-active pharmaceuticals (Fig. 2). In MDA-MB-468 cells, only omeprazole induced CYP1A1 mRNA levels that were >30% of that observed for TCDD (Fig. 2C), whereas concentrations of leflunomide (50 and 100 μM) induced CYP1A1 protein levels similar to that observed for TCDD (Fig. 1B) but induced <30% of the CYP1A1 mRNA levels induced by TCDD (Fig. 2B). It is noteworthy that 4-hydroxytamoxifen, mexiletine, and tranilast induced minimal to nondetectable CYP1A1 mRNA levels in MDA-MB-468 cells (Fig. 2, A, B, and D). In contrast, seven of the eight pharmaceuticals induced CYP1A1 mRNA in BT474 cells to ≥45% of the level induced by TCDD, whereas the fold induction for 4-hydroxytamoxifen (Fig. 2A) was only 15 to 20% of that observed for TCDD. The most striking difference was observed for flutamide, which did not induce CYP1A1 protein (Fig. 1A) but was a potent inducer of CYP1A1 mRNA in BT474 cells (Fig. 2A) (>90% of the TCDD-induced response). Effects of AHR-active pharmaceuticals on AHR and CYP1A1 proteins. 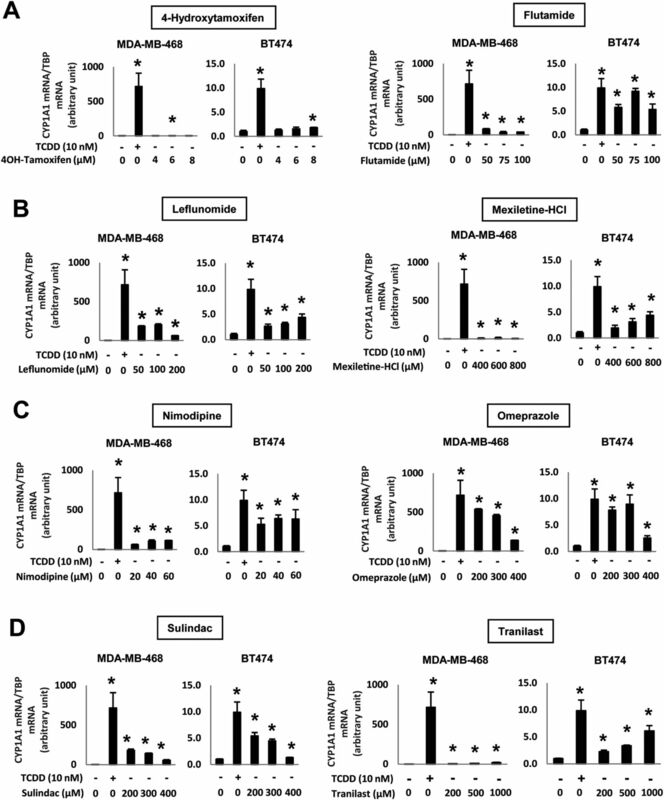 BT474 and MDA-MB-468 cells were treated with DMSO, 10 nM TCDD, and different concentrations of 4-hydroxytamoxifen and flutamide (A), leflunomide and mexiletine (B), nimodipine and omeprazole (C), and sulindac and tranilast (D) for 24 h, and whole cell lysates were analyzed by Western blots as described under Materials and Methods. β-Actin served as a loading control, and similar results were observed in replicate experiments. Common DMSO and TCDD treatments were used as controls for the pharmaceuticals. Induction of CYP1A1 mRNA by AHR-active pharmaceuticals. 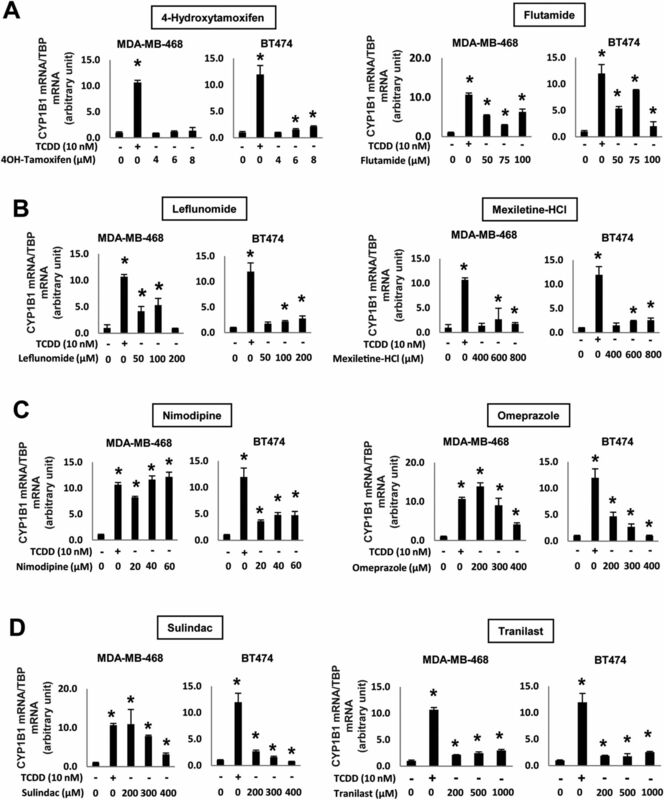 BT474 and MDA-MB-468 cells were treated with DMSO, 10 nM TCDD, and different concentrations of 4-hydroxytamoxifen and flutamide (A), leflunomide and mexiletine (B), nimodipine and omeprazole (C), and sulindac and tranilast (D) for 24 h, and CYP1A1 mRNA levels were determined by real-time PCR as outlined under Materials and Methods. Results are expressed as means ± S.E. for at least three replicate determinations for each treatment group, and significant induction is indicated (*, p < 0.05). The experiments in each cell line were carried out simultaneously, with only a single determination for TCDD carried out in each cell line. TBP mRNA served as a reference control. TCDD induced a 10.7- and 12.0-fold increase in CYP1B1 mRNA expression in MDA-MB-468 and BT474 cells, respectively (Fig. 3). In the former cell line, nimodipine, omeprazole, and sulindac induced CYP1B1 mRNA levels higher than that observed for TCDD (Fig. 3, C and D), and these compounds also induced CYP1B1 protein (Supplemental Fig. 4). Flutamide, leflunomide, nimodipine, sulindac, and omeprazole (Fig. 3) induced CYP1B1 mRNA levels in both cell lines, whereas only leflunomide and nimodipine induced CYP1B1 protein in both cell lines (Supplemental Fig. 4). Minimal induction of CYP1B1 mRNA was observed for 4-hydroxytamoxifen, mexiletine, and tranilast in these cells (Fig. 3, A, B, and D), whereas tranilast and mexiletine induced CYP1B1 protein in MDA-MB-468 but not BT474 cells (Supplemental Fig. 4). Induction of CYP1B1 mRNA by AHR-active pharmaceuticals. BT474 and MDA-MB-468 cells were treated with DMSO, 10 nM TCDD, and the pharmaceuticals, 4-hydroxytamoxifen and flutamide (A), leflunomide and mexiletine (B), nimodipine and omeprazole (C), and sulindac and tranilast (D), and CYP1B1 mRNA levels were determined by real-time PCR as outlined under Materials and Methods. Significant induction is indicated (*, p < 0.05). 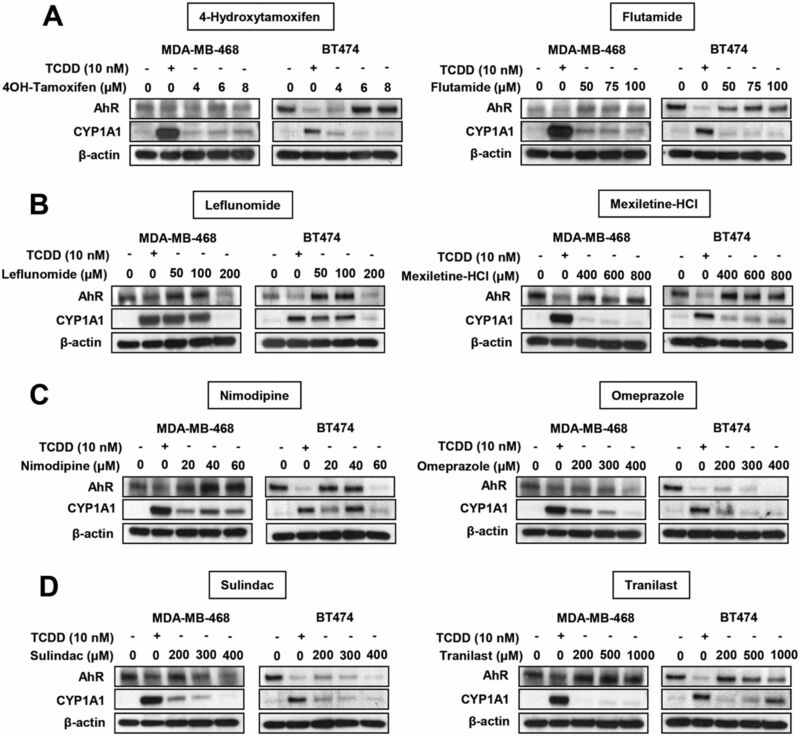 4-Hydroxytamoxifen, mexiletine, and tranilast exhibited minimal to nondetectable AHR agonist activity for the induction of CYP1A1 mRNA in MDA-MB-468 cells (Fig. 2), and their potential AHR antagonist activity was determined by cotreatment with 10 μM TCDD for 2 or 24 h (Fig. 4). 4-Hydroxytamoxifen did not significantly inhibit the induction of CYP1A1 mRNA by TCDD after treatment for 2 or 24 h; however, there was some inhibition of TCDD-induced CYP1A1 protein at the highest concentration (8 μM) of 4-hydroxytamoxifen. 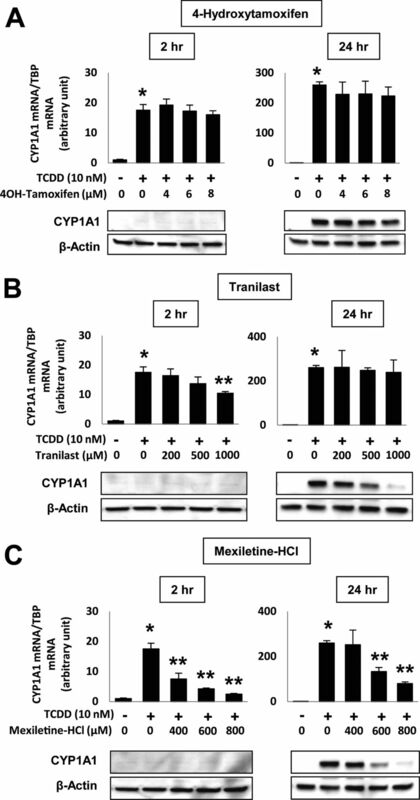 Tranilast inhibited TCDD-induced CYP1A1 mRNA only at the highest concentration (1000 μM) after 24 h, whereas there was a concentration-dependent inhibition of CYP1A1 protein (24 h). Mexiletine inhibited TCDD-induced CYP1A1 mRNA (2 and 24 h) and protein (24 h) expression. Among the three pharmaceuticals, mexiletine was the most effective AHR antagonist. AHR antagonist activities of AHR-active pharmaceuticals in MDA-MB-468 cells. Cells were treated with DMSO, 10 nM TCDD, and different concentrations of 4-hydroxytamoxifen (A), tranilast (B), or mexiletine (C) alone or in combination for 2 or 24 h and analyzed for CYP1A1 mRNA expression by real-time PCR as outlined under Materials and Methods. Results are expressed as means ± S.E. for at least three replicate determinations, and significant (p < 0.05) induction by TCDD (*) or inhibition of TCDD-induced CYP1A1 mRNA (**) is indicated. A ChIP assay was used to compare TCDD-induced recruitment of the AHR to the proximal CYP1A1-DRE promoter (Zhang et al., 2012) with that observed for 4-hydroxytamoxifen (Fig. 5A), mexiletine (Fig. 5B), tranilast (Fig. 5C), and omeprazole (Fig. 5D). TCDD and the AHR-active pharmaceuticals enhanced AHR recruitment, and omeprazole and TCDD were the most effective of these compounds. The effects of the AHR-active pharmaceuticals in combination with TCDD on formation of the AHR complex were also investigated, and only mexiletine significantly decreased TCDD-induced AHR binding to the CYP1A1-DRE in the ChIP assay (Fig. 5B). These results are consistent with the AHR agonist and antagonist activities of omeprazole and mexiletine, respectively, in MDA-MB-468 cells. ChIP assay of AHR binding to the CYP1A1 promoter. MDA-MB-468 cells were treated with DMSO, 10 nM TCDD, and 4-hydroxytamoxifen (A), mexiletine (B), tranilast (C), and omeprazole (D) (alone or with TCDD). AHR binding to the CYP1A1 gene promoter was determined in a ChIP assay as described under Materials and Methods. Results are means ± S.E. for each treatment group. A significant (p < 0.05) increase in AHR binding by TCDD (*) and decrease after cotreatment (**) are indicated. Previous functional studies with TCDD and MCDF in breast cancer cells showed that both compounds inhibit cell migration in a Boyden chamber assay (Zhang et al., 2012). Figure 6A illustrates the effects of TCDD and the pharmaceutical AHR ligands on this response in MDA-MB-468 cells. TCDD (10 nM) induced a >30% decrease in cell migration, and similar effects were observed for leflunomide (Fig. 6B), nimodipine (Fig. 6C), and tranilast (Fig. 6D). At the concentrations used in this study, 4-hydroxytamoxifen (Fig. 6B), mexiletine (Fig. 6C), and sulindac (Fig. 6D) did not inhibit migration, whereas 20 μM flutamide (Fig. 6B) and 200 μM omeprazole (Fig. 6C) decreased cell migration by >60%. The effects of 100 and 200 μM omeprazole on MDA-MB-468 cell invasion were significantly reversed after knockdown of the AHR by RNA interference. Reversal of 10 and 20 μM flutamide-induced invasion by RNA interference was observed only at the former dose (Supplemental Fig. 5). Thus, there was not a correlation between the functional activities (inhibition of migration) and Ah responsiveness (CYP1A1 induction) for most of the AHR-active pharmaceuticals with the exception of omeprazole, which was both a potent inducer of CYP1A1 and an inhibitor of cell migration. These results demonstrate that for eight pharmaceuticals previously characterized as AHR agonists their AHR activity is highly variable in MDA-MB-468 and BT474 cells and is consistent with their designation as SAhRMs that exhibit tissue-specific AHR agonist or antagonist activities. Inhibition of cell migration by AHR-active pharmaceuticals. MDA-MB-468 cells were treated with DMSO, 10 nM TCDD, and different concentrations of the pharmaceuticals, and cell migration was determined as outlined under Materials and Methods. Results for TCDD and 4-hydroxytamoxifen (A), flutamide and leflunomide (B), mexiletine, nimodipine, and omeprazole (C), sulindac and tranilast (D) were determined in three replicate experiments, and significant inhibition of cell migration is shown (*, p < 0.05). The AHR is a ligand-activated receptor that not only plays a role in mediating the toxicity of TCDD and related compounds but is also a potential target for the treatment of several diseases including autoimmune diseases, various inflammatory conditions, and cancer (McDougal et al., 2001; Quintana et al., 2008, 2010; Zhang et al., 2009, 2012; DiNatale et al., 2010b, 2011; Murray et al., 2010; O'Donnell et al., 2010; Kiss et al., 2011; Li et al., 2011; Opitz et al., 2011; Singh et al., 2011). Depending on the tissue or cell, AHR agonists or antagonists may be required, and there is also evidence that the effects of various AHR-active compounds are structure-dependent. For example, TCDD induced functional Treg cells and significantly suppressed autoimmune encephalomyelitis in a mouse model, whereas the endogenous AHR agonist 6-formylindolo[3,2-b]carbazole enhanced the severity of the response (Quintana et al., 2008). It is noteworthy that 2-(1′-H-indole-3′-carbenyl)-thiazole-4-carboxylic acid, another endogenous AHR agonist, protects against autoimmune encephalomyelitis in the mouse model. Kynurenine is a tryptophan catabolite and AHR agonist (DiNatale et al., 2010a), and this compound enhances AHR-dependent brain tumor cell survival and motility (Opitz et al., 2011), suggesting that a cell-specific AHR antagonist would have possible clinical efficacy for treating brain tumors in humans overexpressing the enzyme tryptophan-2,3-dioxygenase, which is responsible for kynurenine biosynthesis. Our previous studies demonstrated the effectiveness of AHR agonists for inhibiting ER-positive and ER-negative mammary tumor growth or metastasis, respectively (McDougal et al., 2001; Zhang et al., 2009, 2012). 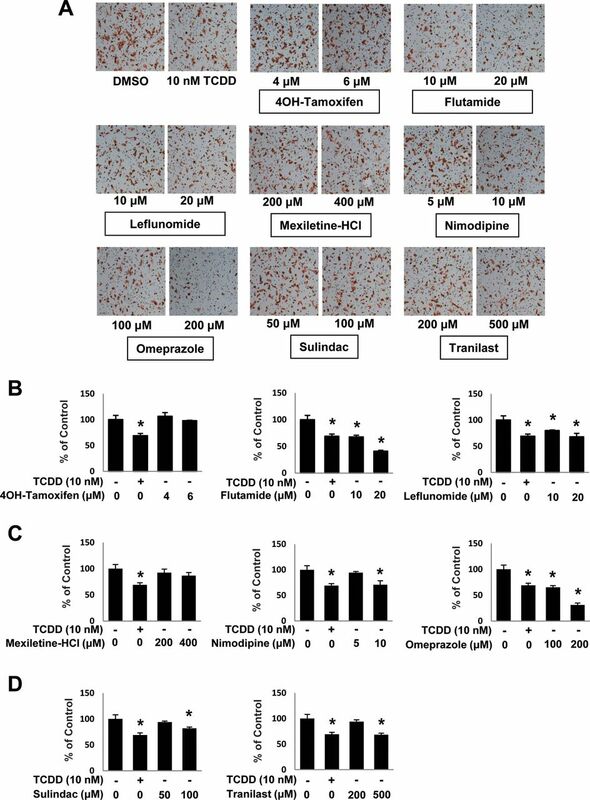 The effects of AHR agonists in ER-negative breast cancer cells were intriguing because both TCDD and the SAhRM MCDF inhibited tumor cell migration and invasion in vitro and MCDF inhibited lung metastasis in a mouse model administered MDA-MB-231 cells by tail vein injection (Zhang et al., 2012). Several clinically used pharmaceuticals have previously been characterized as AHR agonists in various cell models and in vivo; therefore, these compounds may also have clinical applications for breast cancer chemotherapy. The major objective of this study was to investigate their AHR activity in two previously characterized AHR-expressing cell lines. MDA-MB-468 is a prototypical triple negative breast cancer cell line that does not express ER, progesterone receptor, or the oncogene ErbB2, and treatment with TCDD not only inhibits growth but also is a potent inducer of CYP1A1 (Wang et al., 1997). BT474 is a highly aggressive cancer cell line that overexpresses the ErbB2 oncogene, and TCDD inhibits cell growth and migration/invasion but exhibits minimal induction of CYP1A1 (>10-fold). Initially, we investigated the growth inhibitory effects of these compounds because this response might affect Ah responsiveness and would affect interpretation of functional cell migration studies. Differences in growth inhibition were compound- and cell context-dependent. Growth inhibition was observed for all compounds except tranilast at the highest concentration used, and, among the remaining pharmaceuticals, sulindac preferentially inhibited growth of MDA-MB-468 versus BT474 cells (Supplemental Fig. 1). The results for tranilast were somewhat surprising because previous studies showed that a 200 μM concentration inhibited BT474 cell growth and migration (Quintana et al., 2010; Subramaniam et al., 2010, 2011). We also observed Ah responsiveness (CYP1A1 induction) for tranilast in BT474 cells (Figs. 1 and 2); however, in MDA-MB-468 cells, tranilast induced minimal to nondetectable CYP1A1 protein or mRNA and, at short time points (2 h) to minimize metabolism of the drug, tranilast significantly inhibited induction of CYP1A1 mRNA by TCDD (Fig. 4B). Moreover, tranilast significantly inhibited induction of CYP1A1 protein by TCDD, demonstrating partial AHR agonist/antagonist activity for this compound. 4-Hydroxytamoxifen exhibits AHR agonist activity in ER-negative MDA-MB-231 and SKBR3 (ErbB2-overexpressing) cells (DuSell et al., 2010); however, among the eight AHR-active pharmaceuticals examined in this study, 4-hydroxytamoxifen was among the least active compounds and did not induce CYP1A1 or CYP1B1 mRNA levels in MDA-MB-468 cells. One of the significant observations of this study was the importance of cell context in defining the AHR agonist or antagonist activity of the AHR-active pharmaceuticals. All of these compounds significantly induced CYP1A1 and CYP1B1 mRNA levels in BT474 cells with variable efficacies, and only flutamide did not induce CYP1A1 protein. With the exception of leflunomide and nimodipine, induction of CYP1B1 protein was not observed in BT474 cells (Supplemental Fig. 4). In contrast, tranilast, mexiletine, and 4-hydroxytamoxifen exhibited minimal to nondetectable AHR agonist activity in MDA-MB-468 cells, whereas the other AHR-active pharmaceuticals exhibited some AHR agonist activity with omeprazole being the most active compound in both cell lines. Furthermore, we also showed that, among the least active compounds in MDA-MB-468 cells, mexiletine was an AHR antagonist and inhibited >90% of TCDD-induced CYP1A1 mRNA after treatment for 2 h, whereas tranilast was a partial AHR antagonist. 4-Hydroxytamoxifen did not inhibit TCDD-induced CYP1A1 mRNA levels (2 and 24 h) but partially blocked induced CYP1A1 protein (24 h) in MDA-MBA-468 cells (Fig. 4). In contrast, a ChIP assay indicated that all three compounds recruited the AHR complex to the CYP1A1 promoter in MDA-MB-468 cells, even though CYP1A1 induction was not observed (Fig. 5). Thus, for a series of eight pharmaceuticals previously identified as AHR agonists in different assays and cell lines (Quattrochi and Tukey, 1993; Dzeletovic et al., 1997; Ciolino et al., 2006; Hu et al., 2007; DuSell et al., 2010; O'Donnell et al., 2010; Subramaniam et al., 2010, 2011; Prud'homme et al., 2010), the AHR agonist and antagonist activities were structure-, cell context-, and response-dependent (Table 1). Mexiletine is an excellent example of these differences; this compound exhibited AHR agonist activity in rodent liver and rodent hepatoma cell lines (Hu et al., 2007) and was an AHR antagonist in MDA-MB-468 cells (Fig. 4). The effects of the AHR-active pharmaceuticals on MDA-MB-468 cell migration were also structure-dependent; however, it is possible that this response was a combination of AHR-dependent and -independent pathways, and this is currently being investigated. Omeprazole was the most consistent AHR agonist and the most potent inhibitor of cell migration (Fig. 6) that was AHR-dependent (Supplemental Fig. 5). Our current studies are focused on development of this agent and structurally related compounds for treating ER-negative breast cancer. Numbers represents percentage of 10 nM TCDD response. Participated in research design: Safe. Conducted experiments: Jin and Lee. Contributed new reagents or analytic tools: Lee and Safe. Performed data analysis: Jin and Lee. Wrote or contributed to the writing of the manuscript: Jin, Lee, and Safe. This work was supported by the National Institutes of Health National Cancer Institute [Grant R01CA142697] and Texas AgriLife. (1991) 6-Alkyl-1,3,8-trichlorodibenzofurans as antiestrogens in female Sprague-Dawley rats. Toxicology 69:187–197. (1988) 6-Methyl-1,3,8-trichlorodibenzofuran as a 2,3,7,8-tetrachlorodibenzo-p-dioxin antagonist: inhibition of the induction of rat cytochrome P-450 isozymes and related monooxygenase activities. Mol Pharmacol 33:231–236. (1989) 6-Methyl-1,3,8-trichlorodibenzofuran (MCDF) as a 2,3,7,8-tetrachlorodibenzo-p-dioxin antagonist in C57BL/6 mice. Toxicology 54:139–150.
. (2010) Aryl hydrocarbon receptor antagonists promote the expansion of human hematopoietic stem cells. Science 329:1345–1348. (2006) Sulindac regulates the aryl hydrocarbon receptor-mediated expression of phase 1 metabolic enzymes in vivo and in vitro. Carcinogenesis 27:1586–1592. (2010a) Kynurenic acid is a potent endogenous aryl hydrocarbon receptor ligand that synergistically induces interleukin-6 in the presence of inflammatory signaling. Toxicol Sci 115:89–97. (2010b) Mechanistic insights into the events that lead to synergistic induction of interleukin 6 transcription upon activation of the aryl hydrocarbon receptor and inflammatory signaling. J Biol Chem 285:24388–24397. (2011) Ah receptor antagonism inhibits constitutive and cytokine inducible IL6 production in head and neck tumor cell lines. Mol Carcinog 50:173–183. (2010) Regulation of aryl hydrocarbon receptor function by selective estrogen receptor modulators. Mol Endocrinol 24:33–46. (1997) Regulation of dioxin receptor function by omeprazole. J Biol Chem 272:12705–12713. (1989) Partial antagonism of 2,3,7,8-tetrachlorodibenzo-p-dioxin-mediated induction of aryl hydrocarbon hydroxylase by 6-methyl-1,3,8-trichlorodibenzofuran: mechanistic studies. Mol Pharmacol 35:729–735. (2007) Induction of cyp1a1 is a nonspecific biomarker of aryl hydrocarbon receptor activation: results of large scale screening of pharmaceuticals and toxicants in vivo and in vitro. Mol Pharmacol 71:1475–1486. (2001) Tamoxifen-induced antitumorigenic/antiestrogenic action synergized by a selective aryl hydrocarbon receptor modulator. Cancer Res 61:3902–3907. (2011) Suppression of cytokine-mediated complement factor gene expression through selective activation of the Ah receptor with 3′,4′-dimethoxy-α-naphthoflavone. Mol Pharmacol 79:508–519. (2010) Evidence for ligand-mediated selective modulation of aryl hydrocarbon receptor activity. Mol Pharmacol 77:247–254.
. (2010) The anti-inflammatory drug leflunomide is an agonist of the aryl hydrocarbon receptor. PLoS One 5:e13128.
. (2011) An endogenous tumour-promoting ligand of the human aryl hydrocarbon receptor. Nature 478:197–203. (1976) Stereospecific, high affinity binding of 2,3,7,8-tetrachlorodibenzo-p-dioxin by hepatic cytosol. Evidence that the binding species is receptor for induction of aryl hydrocarbon hydroxylase. J Biol Chem 251:4936–4946. (1993) Nuclear uptake of the Ah (dioxin) receptor in response to omeprazole: transcriptional activation of the human CYP1A1 gene. Mol Pharmacol 43:504–508. (2008) Control of Treg and TH17 cell differentiation by the aryl hydrocarbon receptor. Nature 453:65–71. (2010) An endogenous aryl hydrocarbon receptor ligand acts on dendritic cells and T cells to suppress experimental autoimmune encephalomyelitis. Proc Natl Acad Sci U S A 107:20768–20773. (1986) Comparative toxicology and mechanism of action of polychlorinated dibenzo-p-dioxins and dibenzofurans. Annu Rev Pharmacol Toxicol 26:371–399. (2012) AHR-active compounds in the human diet, in The AH Receptor in Biology and Toxicology (Pohjanvirta R ed) pp 331–342, John Wiley & Sons, Inc., Hoboken, NJ. (2011) Activation of aryl hydrocarbon receptor (AhR) leads to reciprocal epigenetic regulation of FoxP3 and IL-17 expression and amelioration of experimental colitis. PLoS One 6:e23522. (2011) Tranilast treatment decreases cell growth, migration and inhibits colony formation of human breast cancer cells. Exp Mol Pathol 90:116–122. 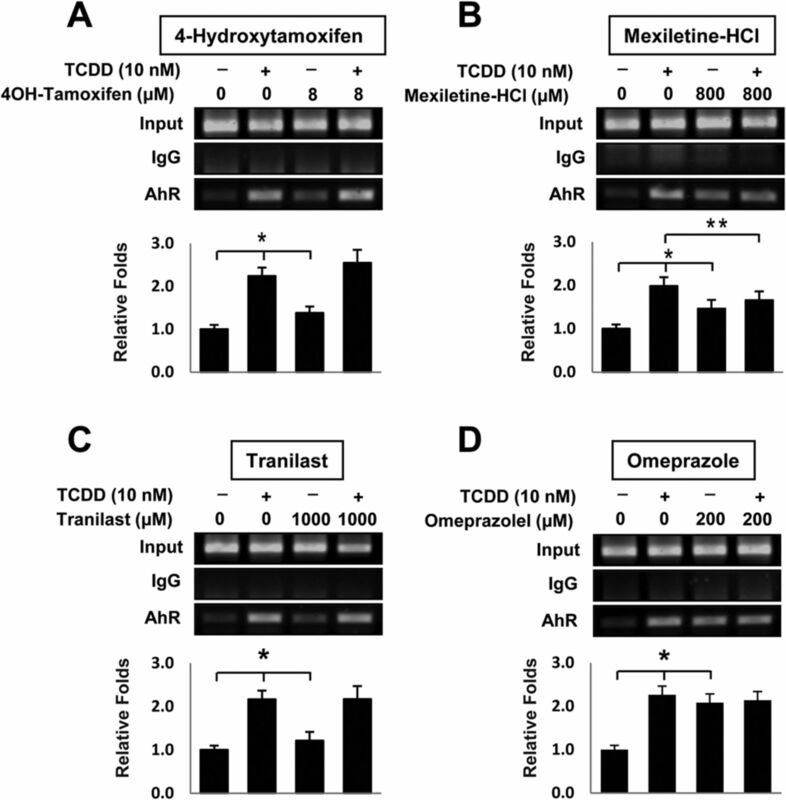 (2010) Tranilast inhibits cell proliferation and migration and promotes apoptosis in murine breast cancer. Anticancer Drugs 21:351–361. (1997) Mechanism of inhibition of MDA-MB-468 breast cancer cell growth by 2,3,7,8-tetrachlorodibenzo-p-dioxin. Carcinogenesis 18:925–933. (1989) 2,3,7,8-Tetrachlorodibenzo-p-dioxin-induced porphyria in genetically inbred mice: partial antagonism and mechanistic studies. Toxicol Appl Pharmacol 100:208–216. (1992) 6-Methyl-1,3,8-trichlorodibenzofuran (MCDF) as an antiestrogen in human and rodent cancer cell lines: evidence for the role of the Ah receptor. Toxicol Appl Pharmacol 113:311–318. (2009) The aryl hydrocarbon receptor as a target for estrogen receptor-negative breast cancer chemotherapy. Endocr Relat Cancer 16:835–844. (2010) CH223191 is a ligand-selective antagonist of the Ah (Dioxin) receptor. Toxicol Sci 117:393–403.